Vacation is an exciting time that many people look forward to for several weeks or month. As the excitement builds and the final plans fall into place, it’s important to remember some basic tips to help keep you safe on the road. Distractions that cause car accidents can ruin your vacation and hurt other people. Even if you have a GPS or have printed out directions, it can be challenging to figure out where you’re going when you’re unfamiliar with the roads. If it’s somewhere you haven’t been before, adjusting to various speed limits and toll booths can also throw you off, making you feel like you need to check that you’re on the right path every so often. Appoint someone else in the car to help you with directions in order to avoid feeling too distracted on the road. 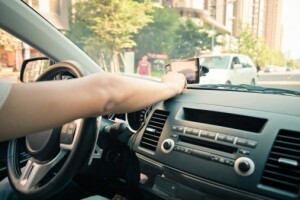 If you’re using a GPS, make use of both the visual and audio aspects to maximize your experience and make sure that you’re clear of where you’re headed. Whether they’re sick of being in the car or are anxious to get to the final destination, it can be challenging to take long road trips with children. You may feel that you’ll have to entertain them. Try to pack activities, books, or videos in advance so that your kids are entertained without you taking your attention away from the road. If the kids are getting too rowdy, find somewhere like a park or small attraction along the way to let them burn off some steam while you stretch your legs. Remind your children that their safety partly depends on your ability to operate the vehicle safely. Don’t get frustrated with their behavior wherever possible, because it can make the situation even worse and once again pull your attention away from where it needs to be. If you’re the lone driver for a long stretch, it gets tempting to change the radio often to keep you awake. If you start to get tired, the radio is a common location to help re-energize you and pull you out of a long drive lull. Don’t get too caught up in playing with radio settings or searching for something ideal, because you might not be alert to situations happening right in front of you. The same goes for talking on the phone or talking to someone else in the car. While these can be helpful in keeping you awake, they can also make you distracted and lead to car accidents. Limit your distractions and ask to change driving shifts if possible. If you end up in an accident, you’ll want to immediately remove your vehicle from the roadway if this is possible. Seek medical attention as soon as possible even if it doesn’t seem like you have any injuries. If you have been in an accident while on your vacation as a result of distracted driving, contact an attorney who specializes in personal injury so that you can have your case evaluated. Previous post: Does a Waiver Excuse a Business from Medical Claim?